Every human being was born with great dreams but only a very view end up achieving or getting close to their dreams in life. “Take the Lead And Live your Dreams” will not only inspire you but more importantly will show you how to take the lead and live a fulfilling and impactful life. Irrespective of your current level, this book will help you to move from where you are to where you really want to be in life. When you take the lead of your life, you automatically become a better person because you have better control over issues pertaining to your life. Taking the lead means to wake up and take control of your life. It means to get up and become a participant rather than being a spectator in the affairs of your life. 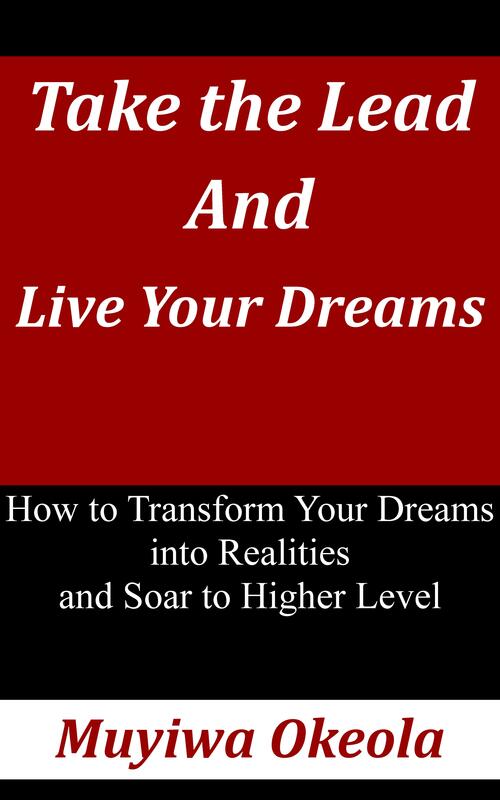 This book will show you what you need to do to take the lead, transform your dreams into realities and soar to higher level. “Take the Lead and Live Your Dreams” is available at major ebook retailers. Please click here for more details. This entry was posted in Books, Inspiration, Personal Development and tagged Books, Control, Dreams, Entrepreneurship, Imagination, Inspiration, Leadership, Life Purpose, Living Your Dreama, Maturity, Personal Development, Responsibility, Success, Transformation, Vision. Bookmark the permalink. Is Faith an Alternative for Action? Are you Working Hard or Smart? Change your Mindset, Transform your Life! Go the Extra Mile, Succeed More! What’s your Real Financial Status?